“The immunologist’s dirty little secret” is a secret no longer, and it’s not even so dirty any more now that we have started to understand a little about it. The “dirty little secret” line was coined by Charlie Janeway, in a 1989 essay1 that was one of the few really revolutionary single papers in immunology. As just about anyone even peripherally involved with immunology knows, Charlie was referring to the puzzle of how immune responses start. At the time, the paradigm was simply that non-self triggered an immune response, while self did not. Yet of course that was not exactly true; to induce a real immune response, experimentally or clinically, immunologists had to include crap2 along with their non-self — the crappier the better, as far as immunity was concerned. 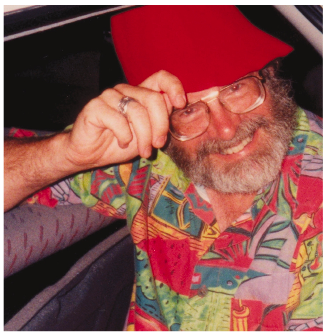 Charlie’s proposal was that as well as non-self, an adaptive immune response needed some indication that the non-self was dangerous, and he suggested that the innate immune system must include receptors for pathogen-assocated molecular patterns (PAMPs).3 Triggering the PAMP receptor would signal a dangerous condition, and drive the adaptive response forward. Janeway’s ideas have been proven brilliantly right, of course. The immune system does recognize PAMPs, via a bunch of receptors including (but not limited to) the dozen-plus toll-like receptors (TLRs), RIG-I, and many others. These receptors bind to various generic aspects of pathogens, like the double-stranded RNA of some viral genomes, the lipopolysaccharide in a gram-negative bacterium, or the unmethylated CpG in a bacterial genome. But Janeway’s PAMPs concept had competition. Polly Matzinger, most famously, proposed a somewhat different “Danger” theory,4 which I’ll refer to as the, um, Danger Theory. According to this theory (and I simplify), adaptive responses happen when normal tissues are damaged — perhaps because the injection had toxic crap along with it, or perhaps simply because of tissue damage associated with the treatment. 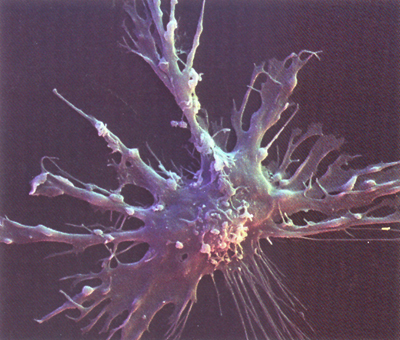 Detection of factors released by damaged cells would indicate that there was a dangerous situation, and that would trigger the adaptive response. So this is conceptually quite similar to the PAMP explanation, but relies on tissue damage rather than pathogen presence. In fact, the fundamental observation was well established: When cells are damaged, they do release factors that enhance adaptive immune responses. 7 It proved very difficult to purify the specific factor(s) responsible for this, but in 2003 Shi et al. identified one such factor as uric acid.8 I’m not going to talk about that now — it was while I was in the Rock lab, so it was just two benches away from me, a very exciting period — except to note that Yan also identified other fractions in the damaged-cell lysate that had similar activity. Cancer patients and their physicians who receive and apply chemotherapy, respectively, do so in the genuine belief that the prime goal of therapy is to destroy tumor cells. Here, we show for the first time that anticancer chemotherapy has an additional, decisive effect. Dying tumor cells elicit an immune response that is required for the success of therapy. The clinical relevance of these findings is underscored by the observation that the Asp299Gly TLR4 mutation, which affects the binding of HMGB1 to the receptor, has a negative prognostic impact on human patients with breast cancer. 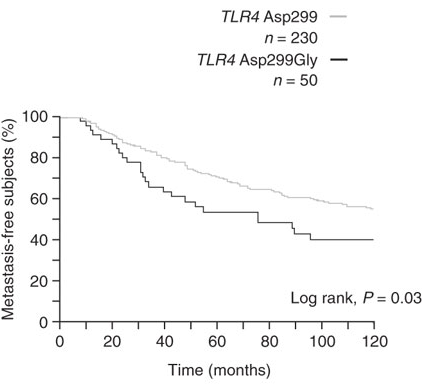 (The figure to the right, above, shows survival of breast cancer patients with a version of TLR4 that does not bind to HMGB1 [the dark trace] compared to those with the “wild-type” TLR4, which does bind HMGB1 [grey trace]). This is not the whole story — they make a case for calreticulin playing a part as well, for example — but if true this is not only very cool, but also a little unsettling; it kind of makes chemotherapy sound like cargo-cult medicine, or witch-doctory, trying to cause cell death even though that is only peripheral to the true therapeutic effect of priming adaptive immunity. Focusing on triggering cross-priming rather than cell death may offer new approaches to cancer therapy. The overall observation, of course, is further encouragement to the concept of cancer vaccines. Thanks for this post! I really learned a lot. It’s a bit extreme to call chemotherapy and radiotherapy cargo-cult medicine. Even if it only kills a portion of the tumour cells, that’s still a substantially smaller load of cancer cells remaining for the immune system to clear, and given that tumour cells multiply fast, that’s not a mathematically trivial thing.